The fermentation of yeast, sugars, and starches is the process that produces alcohol. It depresses the central nervous system and is swiftly absorbed into the bloodstream via the stomach and small intestine. The measurement for a “standard drink” is 12 ounces of beer; 5 ounces of wine; 8 ounces of malt liquor; 1.5 ounces of 80-proof distilled spirits or liquor (such as rum, vodka, or whiskey), or 0.6 ounces of pure ethanol. Every organ in the drinker’s body is affected by alcohol, and it can also cause catastrophic damage to a developing fetus. Intoxication impairs brain function and slows motor skills. 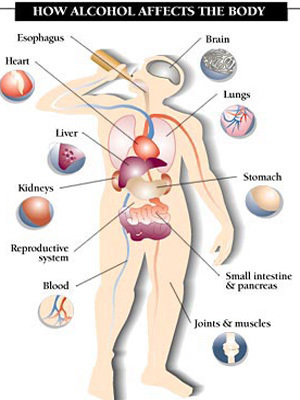 The risk of certain types of cancer, stroke, and liver disease is significantly increased with heavy, long-term use. Alcoholism and alcohol dependence are recognized diseases categorized by continual use due to a strong craving for alcohol; often despite harm or personal injury incurred because of drinking. Alcohol abuse leads to alcoholism. Alcohol abuse is similar to alcoholism because it is a pattern of drinking that results in harm to one’s health, interpersonal relationships, or ability to work. It is different than alcoholism because there is no established dependence present with alcohol abuse. Alcohol causes havoc on the body and can lead to long-term damage. Over a period of time, a person who consistently uses alcohol will develop a tolerance to the effects of drinking. From that point on, it will consistently take more alcohol to achieve the desired effects. It is likely that the person will grow dependent on alcohol, and in turn, can lead to a severe case of alcoholism. Heavy drinking can cause permanent damage to the body and brain. The severity and extent of this damage is impacted by numerous aspects, including the age and gender of the drinker as well as the duration and extent of abuse.